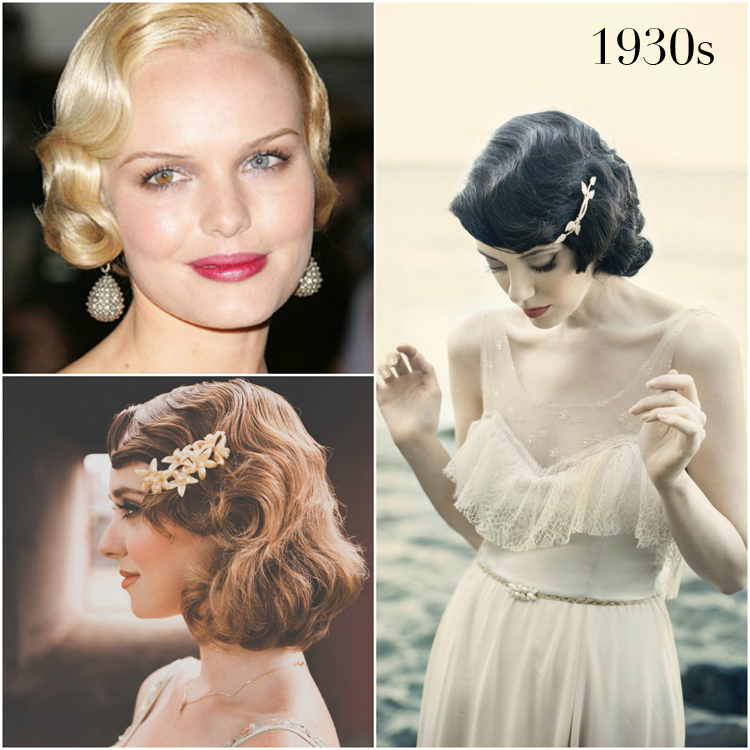 The movie The Great Gatsby got me thinking about vintage wedding hairstyles. I’ve always loved vintage hairstyles and I tend to draw inspiration from bygone eras when I design and create my bridal headpieces and accessories. But, I must admit, I sometimes find it hard to tell the difference between a 1920’s hairstyle from a 1940’s look. Please tell me it’s not just me who finds it all a bit confusing! I decided to spend some time researching the decades and the influence of society at the time on women’s hair and fashion. Now I must say, this is my kind of homework! There was a lot of information out there but I thought I’d pull together a little summary for you here today. So for the modern day bride looking for hair inspiration from bygone eras, here’s a breakdown of some of the defining looks of each decade. Adding some vintage flair to a modern wedding is the ultimate in bridal glamour and refined sophistication – so, here goes! 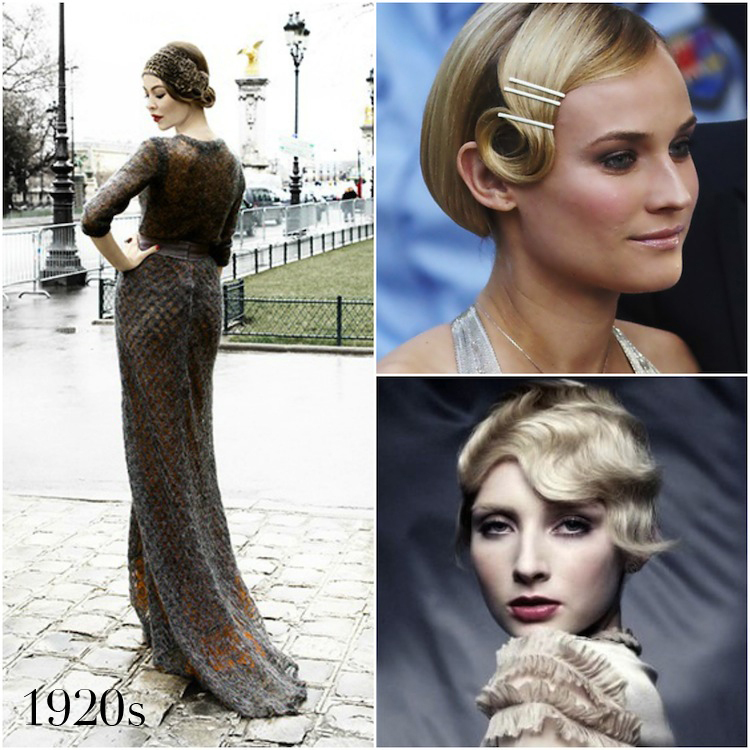 The Roaring Twenties is synonymous with flappers, jazz music and old Hollywood. The prohibition era sparked a fashion upheaval where women threw out their traditional clothing and the puritan styles of the early 1900s. For the first time, women were drinking alongside men in the ‘speakeasies’. They cut their hair. They also cut and shortened their hemlines. And while they were at it, they showed a little more cleavage. The Royals and fashion designers at the time (think Coco Chanel) played a huge role in styling Hollywood – both in fashion and in beauty. In turn, Hollywood influenced the people and the infamous flapper dress, cropped Shingle and angled Dutch Boy haircuts took over. The 1920s art deco look continues to inspire many modern brides. While at the time, hair was short and featured tight curls and finger waves with minimal body, these signature looks are still achievable with long flowy locks and modern day hair dos. They say all good things must come to an end. The fun and frivolity of the 1920s came to a halt in 1929 when the stock market crashed. The economic situation at the time meant regular haircuts weren’t always possible so women had to think of other ways to maintain their looks. They grew out their hair to their shoulders and replaced short choppy boyish hairstyles with gentle softer waves. Pin curls from the 1920s became finger waves and they became a popular way to soften the harsh blunt bob. This hairstyle suited more women at the time as they spent more time working out of the home. Hollywood continued to influence fashion and makeup. Signature looks now included plucked eye brows, hair dye, hair rolls and snoods which all became fashion trends which we still draw inspiration from today. The difficult times that followed the stock market crash in 1929 was then followed by the war in the 1940s. Despite the hard times, hairstyles still played a huge role in fashion. Hair lengths now varied – women sported short bobs, shoulder length waves and even long hair with gentle curls. The key element to these hairstyles was they had to be practical. Upswept hair became a new trend as more women entered the workforce to fill jobs while the men were at war. But where did the Victory Roll come from you might be wondering? The Victory Roll was named after a plane maneuver used in WWII. It was a patriotic symbol of victory and used to honour the soldiers who fought. It features a signature ‘V’ shape which has inspired many modern day wedding hairstyles and pin-up and rockabilly brides. And what is the Queue Curl? It was a distinctive 1940s hairstyle which features a flat top, wavy and rolled sides and a gently curled back at the nape of the neck. A creative way to tuck in longer hair into a unique upstyle. The war was over, society was comparatively more prosperous and fashion and glamour took over again. Popular films in Hollywood and the music industry influenced mainstream fashion and men and women felt free to experiment again. Oh, but we mustn’t forget one very important thing that changed the way women wore their hair. Can anyone guess? The invention of hair styling products such as the trusty can of hairspray. Yes, hairspray and similar products gave men and women the ability to be a little more adventurous with their hair and branch out into the world of more natural looks. Okay, so the history lesson is now over but I hope you found this brief history on vintage hairstyles as interesting as I did. It’s fantastic to see so many modern day brides draw inspiration from these historical looks and movies such as The Great Gatsby will continue to inspire many brides around the world.